I took this photograph at Kroger's last year. Cherie, the flower girl, who was in charge of the flower shop at Kroger's, and that I always visited with and looked at her beautiful flowers, had gotten in new roses for Valentine's Day sales. 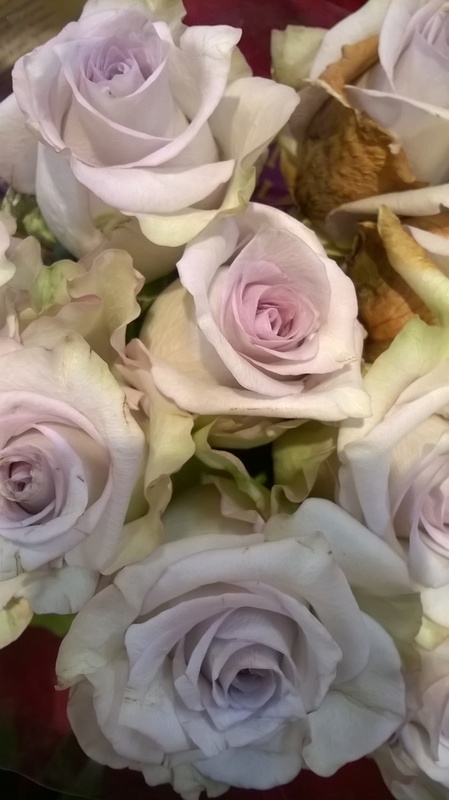 She did not know what kind of roses these were, but she had several kinds in various shades of lavender. Some of the shades of lavender had more pink and some, like this one, more blue. This was my favorite, but they were all so beautiful. I took photos of all of them, hoping I might be able to find ones like them for sale and plant some rose bushes in that color eventually. Cherie used to work at the Clarksville Kroger's, but now works at the New Albany store. The museum was filled with the same old dull, dusty museum exhibits; nothing interested me except the displays of polished rocks and precious and semi-precious stones. I stood in front of the glass cases, row on row of glass cases, admiring the stones. There were stones of all kinds and colors and shapes. Garnets the color of red wine, pale jade, turquoise, yellow topaz, diamonds the color of clear spring water, pale pink polished rose quartz, polished rocks in an infinite array of colors, rocks for which I had no names, sulfur yellow, candy caramel color, obsidian black, clear green. I coveted to touch their smooth hard surfaces. There is something so solid, so eternal about rocks. Downstairs there was a glass case of jeweled trees, exquisite, Japanese bonsai trees fashioned from polished rocks and semi-precious stones. Most were in bloom with realistic looking blossoms. One I especially liked was made of translucent orange stones, a miniature bonsai tree leaning hugely over a tiny Japanese garden, complete with tiny bridge and tiny people, another all of milky white quartz, perhaps a dogwood tree—a whole case of exquisitely jeweled trees—ruby red, smoldering sulfur yellow, all kinds and sizes and shapes. To have jeweled trees, perpetual stone trees in perpetual stone blossom! Trees that would never die because they’d never been alive. There was the inevitable souvenir shop. Even museums must sell souvenirs and make money. My brother buying everything in sight, urging his wife to pick out something for him to buy for her, the way he always does in souvenir shops. I had eyes only for the jade and ivory carvings and the rocks.There was an ivory apple tinted almost edibly red, perfect except for a worm hole in one side. Through the worm hole I could see carved a perfect miniature ivory fisherman, standing on his miniature ivory bridge, perpetually holding a miniature ivory fish, never quite getting around to eating the fish. There was an ivory orange made the same way except that there was a forest inside complete with tiny individual ivory trees. I liked the apple best. There were bins of rocks and polished stones of all kinds. There is a kind of rock called barite that its crystal formations look like realistic stone roses. There was a whole bin of these barite roses, some no bigger than my thumbnail, some a little larger. Outside the souvenir shop was a giant stone rose (not for sale)—it must have weighed a ton—was on display. Securely in its glass case, safe from people who coveted to touch its stone petals. I never buy souvenirs. They never look the same out of the souvenir shop and once you get them home—then they are just junk to set around gathering dust. While my brother was making his choices, though, I stood there coveting the barite roses, the entire bin of them, and the big one not for sale, debating whether or not to buy one. To have stone roses! Perpetual roses in perpetual bloom, roses that would never die because they’d never been alive. One I especially liked a double rose, two stone roses stuck together side by side. Debating whether or not to buy it while my brother bought half the store. Finally I put the barite roses back in their bin and went outside to wait for him. Barite roses are made of stone, gray stone at that. They can never die because they’ve never been alive. Real roses are better. Author’s Note: This story was written on January 1, 1972 by me before I was married. Henson was my maiden name. I gave my mother, Hazel Fern Henson, two copies, an original hand written copy and another slightly rewritten copy that was also hand written. She kept both copies, which she had in a folder, along with other stories I had given her that I’d written many years ago—I think she kept all of the letters and stories I ever gave her, carefully preserving them in her Sewing Room, along with her other treasures. I found everything after she died and left her home and everything in it to me. I combined both versions of this story, changing as little as possible, but combining the best parts of both for this version. The original handwritten manuscripts are returned to the folder in the Sewing Room where she originally saved them. The museum is real, but I don’t remember where it is, or the name of it. 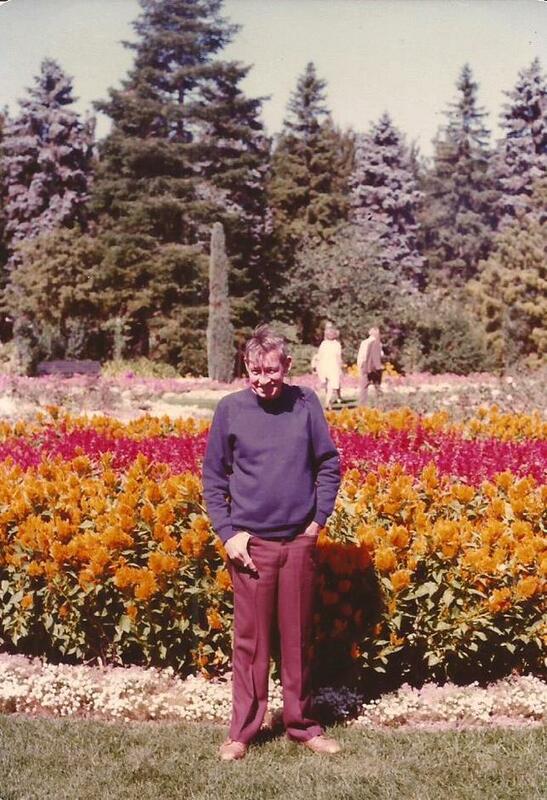 I can’t remember if my brother and his wife were really with us the day Daddy took Mama and me to the museum. I do remember the rocks and all of the “jeweled trees” and the other items mentioned. I especially remember the barite roses. Additional note: This story was originally published February 15, 2016 on Writers-Network. Writers-Network is no longer in business. 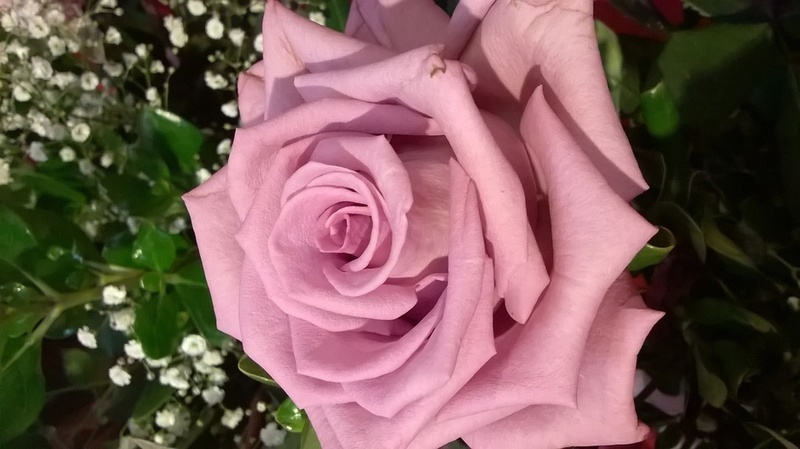 This is one of the roses at the Kroger's flower shop that is more pink, but still one of the special lavender roses that Cherie had in her flower shop that day. 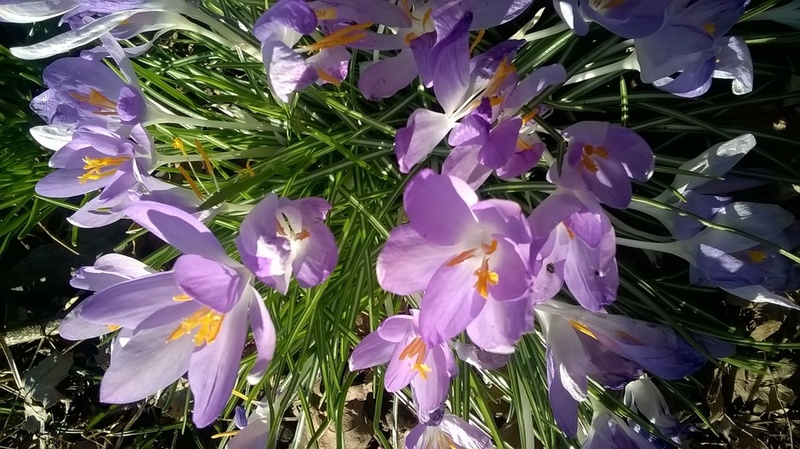 I have other photos of all of them, each a slightly different variation of the lavender color. I had not seen any like them before, and have never seen anymore of the lavender ones anywhere. When I get time I will do a bit of research on possible sources for lavender rose bushes and if I can find any I will publish the information here for those who might want to try growing them also. I did not buy any of the lavender roses because I do not like cut flowers. I leave them on the plants to enjoy outside, so would want the bushes to grow my own, not the cut flowers. I did not know at the time that I might have been able to root some of the cut roses, but have since read an article about rooting cut roses, and if I had known about that then, I would have bought some of them to try doing this. I have never seen anymore since then, though. Later, I will also see if the rose rooting information works, and if I am able to get it to work, will also publish that information for anyone who may want it. Note: I originally started this research for a letter I was writing to a friend to send her along with the story I wrote about the barite roses. The original manuscript had several beautiful photos of the various colored barite roses. Unfortunately, I have no photos of them of my own, and these were from the Internet, so since they were copyright photos, I had to remove them from this manuscript before publishing it to my blog. However, the links are all still in the research, and the photos can be downloaded if you want them. This article is from The Tulsa GeoScience Center in Tulsa, Oklahoma. They have a short informative article about the barite roses, but say nothing about there being other colors besides red. However, I remember the ones at the museum were all gray and Mama’s rose is also gray. Probably the red ones and also the rarer colored ones are more valuable than the plain gray ones. The article can be read online or downloaded as a PDF “for class”. I downloaded it. Evidently, they offer this especially as a service to teachers, but also allow anyone to download it free, as I was able to download it with no problem. The place to download the PDF is at the end of the barite rose article. This is their main website. They appear to be a museum and offer tours and other things, specializing in rocks and fossils. They have a lot of other information on their website, and I bookmarked it to go back to later. This is the main website of the rocksandminerals people. They have a lot of rock information on their website also as well as things to order. They appear to specialize in learning materials and rocks for kids. They have books about rocks, and also rocks and other things for sale. They have barite rocks and others for sale but did not see any barite roses for sale, but did not continue looking so may be on website somewhere. I also bookmarked their website to read more later, but read the barite rose article this time. This page is from the Oklahoma Geological Survey website at the University of Oklahoma. This is the article about the barite roses, also called rose rocks. They, like the Tulsa Geoscience Center, claim that except for a few other places Oklahoma has all the rose rocks and that they are all red. Perhaps the term rose rocks refer only to the red ones because there are other colors. The rocksandminerals4you people have other colors for sale, and the ones I saw at the museum, as well as Mama’s are gray. Be that as it may, I about have enough research for now, and will go back and check this minor point later. You have to know when to call a particular research project ended or you will never finish! There is always more to learn and I will go back for more in-depth study on the barite roses when I have time. I just thought you might find what I’ve found out so far interesting. This is the Oklahoma Geological Survey at the University of Oklahoma’s main website. There is a lot on this site and I bookmarked it for later. The information is all geological stuff. They have many publications and state that many of them are free to download and that they also have hard copies. I will go back to read more later. I searched this term on Bing and came up with this page of results for sellers of the barite roses, but was running out of time allotted for this research today, so only checked out one dealer, but saved the search page for later. I saw one rock shop and she had a lot of rocks, but when I searched her website, she did not have any barite roses. Maybe she will later as she states she has “an ever growing inventory of Rocks and Minerals for you to shop online”. This is the page that came up when I searched barite rose rocks for sale and it has a few assorted rocks of various kinds on it but no barite roses. There were also no barite roses, but other barite rocks on her “barite” page. The shop is located in Katy, Texas and is a real shop in Texas. They sell rocks and rock collecting supplies. This is her main website. Since I have by now definitely used up what time I had allotted for this research today, but want to include a place to buy the barite roses before closing out this article today, I searched “barite roses for sale on Amazon” on Bing. I wasn’t disappointed. If Amazon doesn’t have it, probably it doesn’t exist, or else it isn’t worth buying! I came up with this page of rocks and other related items, including red and gray barite roses. As I figured, some are expensive and some aren’t, with the gray ones being cheaper than the red ones and colored ones, and, of course the smaller ones and less rose shaped ones cheaper than the big ones and more rose shaped ones. There were 20 pages and I did not look at them all, so there may be other colors of the barite roses on the other pages, but I definitely saw the gray and the red ones for sale on the first couple pages I looked at. I hope you enjoy this information. I had fun looking it up, and will go back later and learn more when I get time. ELM STREET IN NEW ALBANY, IND. 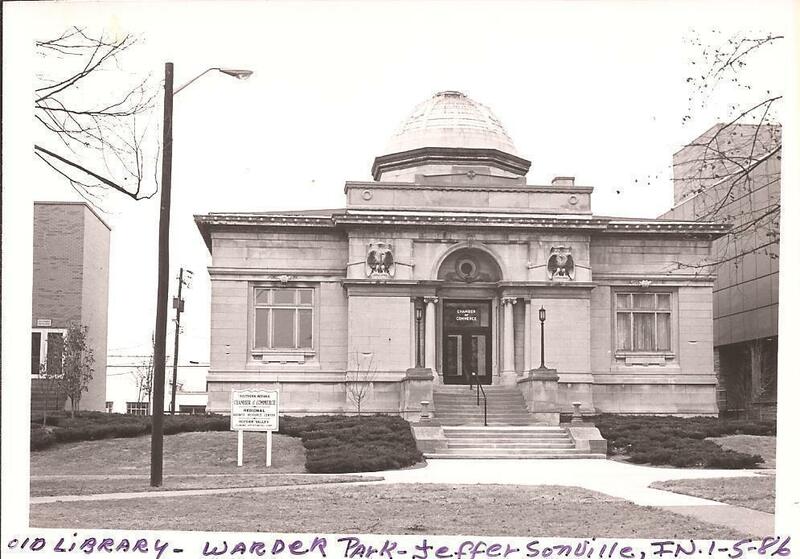 This very old photo is from one of Mama's books of photos of buildings that she and Daddy took. 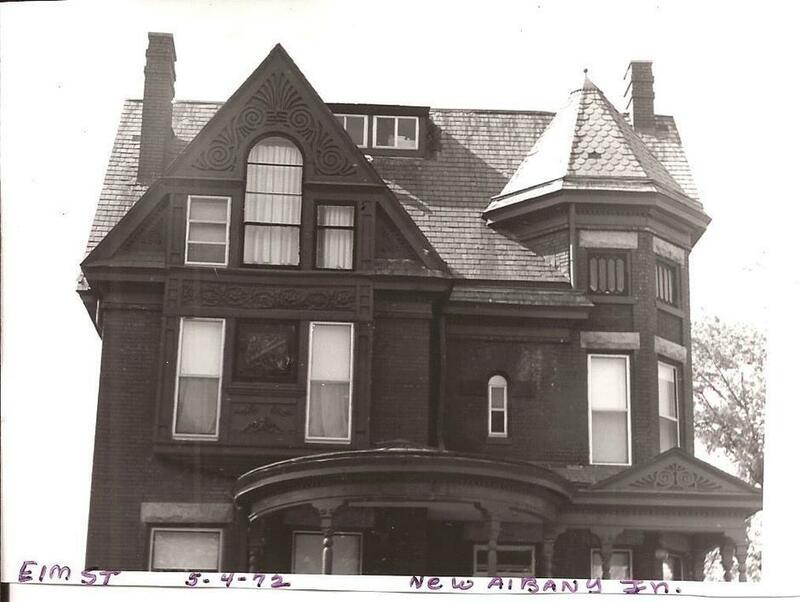 She has at least one book of photos of buildings for New Albany and has old clippings and post cards of historical information in that book also. She has more books of other old buildings in various places. I do not remember ever seeing this house, but I seem to remember her telling me that there was a carving of an old man face on the house, which was why she always called it "the old man house". I believe she also told me it was torn down now. The book I got this photo from does not have any close up showing the old man face, but there may be one somewhere else. I will look for it later and if I find it publish it later. She has more photos of other buildings with carved faces on them which I will continue publishing to illustrate Amy's book. I am not sure if she or Daddy took this photo, but since he mostly took black and white photos and developed them himself, and she mostly took color photos and slides, he gets credit for this photo. Michael didn’t join them for tea, nor did he show up for dinner that evening. It had started snowing again as Amy, Lawrence, and Jane were going into the house and the snow continued all night, gradually getting thicker until it reached blizzard proportions. The next morning when Amy awoke it was still snowing. All during Jane’s morning classes the snow continued steadily blanketing the world in white silence. Amy found it increasingly difficult to keep Jane’s mind on her lessons as the snow seemed to fill her with a strange excitement. Several times Amy caught her doodling pictures of the gargoyles on the edges of her lesson papers. Finally, at eleven thirty Amy gave up and called it quits for the day. It was still snowing hard with no sign of letting up so it would be impossible for them to go outside. Amy hoped that she could keep Jane entertained this afternoon and perhaps get a little time to herself to work on the Christmas sweater she was knitting for Michael. Christmas was only two weeks away and she would have to knit a sweater for Lawrence too as it wouldn’t look right not to. While they were having peanut butter and grape jelly sandwiches and glasses of milk in the kitchen Mrs. Evans came in. “Yes, Mama.” Jane brightened immediately at the prospect of visiting her grandmother, but tried to keep her enthusiasm in bounds in deference to her mother’s orders. The grandmother’s room, or rather suite of rooms, was on the second floor. She was waiting for them in the spacious sitting room and invited them, in a shaky old lady’s voice, to enter as soon as Jane knocked on the door. As Jane rushed over to give her grandmother a big hug Amy looked around the room. In spite of its larger than average size the room looked small and crowded because of the large number of objects in the room. Every available space was crowded with mementos and photographs. The woman sitting in the wheelchair, pulled close to the fireplace for warmth, was a small bird-like woman with snow white hair. Her thin shoulders were covered by an enormous shawl. She looked incredibly old, at least ninety, Amy thought, and it was as though the years had gradually taken all the flesh off her bones, leaving only a papery shell of a human being that one breath of wind would disintegrate. The hand that took Amy’s hand in hers was dry and so fragile Amy was afraid that a handshake would shatter the bones, but the blue eyes peering at her from behind the thick glasses were bright and alert. There was something disturbing about their steady unwavering gaze, though, but Amy couldn’t place what it might be. The old lady released Amy’s hand and the moment passed. The two hours passed quickly with the old lady entertaining them with stories of her girlhood and her young womanhood at Stone River Manor. “But I’m only the governess, not a member of the family as you were, Grandma,” Amy protested. The old lady had asked Amy to please call her Grandma too as everyone else did. “You will be. I see a wedding here soon although I won’t be here to see it. I see a young girl with blond hair, who looks like you, marrying the brother with the same name as my husband’s.” This prediction seemed to tire her and she sat there nodding, half asleep, the firelight making the wrinkles on her face look like cracked china. “We’d better go now, Grandma. Mrs. Evans said we weren’t to stay more than a couple hours. She didn’t want us to tire you,” Amy said. The old lady’s words made her uncomfortable and suddenly the room felt claustrophobic. An unreasoning panic like what she felt when looking at the gargoyles seized her and she felt as if she didn’t get out of that room immediately she would start screaming and never be able to stop. “No need to rush off.” The grandmother grasped her hand in a surprisingly strong grip. The old lady nodded, and relaxed her grip, and sat nodding, half asleep again, seemingly having forgotten their presence. “Good-by, Grandma,” they whispered, stealing softly toward the door. The prediction had chilled Amy more than she liked to admit although she regarded all fortune telling as utter nonsense. The fact that it was Michael she loved and would marry, not Lawrence, if she’d had any kind of hope of marrying either brother, which she didn’t, merely confirmed this view. There was something incredibly old and wise in the old lady’s eyes, though, and remembering their steady blue gaze Amy shivered. Amy knew then what it was about them that she feared. It was that there was something akin to the gargoyles in those old eyes, some terrible knowledge. Amy was sure then that the Grandmother knew why the gargoyles laughed. Amy wanted to ask Jane questions about the former governess, but decided now wasn’t the time for it. It would be better to get the child’s mind on neutral subjects so perhaps she would forget the crazy old lady’s prediction. Jane spent the rest of the afternoon until tea time playing with her huge collection of paper dolls while Amy knitted a blue and white snowflake design sweater for Michael’s Christmas present. Michael had evidently gotten over his mad as he was with them at tea. Amy, her mouth full of jelly doughnut, so she was unable to speak, shook her head. After he left, Amy realized that she had never told him one way or the other if she wanted to see him tomorrow. They had both just taken it for granted that, of course, she would. During the meal, Lawrence, had seemed absorbed in his own thoughts, concentrating on his food. Seen without his toboggan, his hair was curly and brown and he was even more handsome, in a rugged way, than Amy had at first thought. There was a solid strength about him that would be good to lean on. Looking at him now, Amy could see how wrong, how dead wrong, the grandmother’s prediction was, though. If she hadn’t met Michael first perhaps she could have loved Lawrence, but her heart had room for only one love and that love was Michael. That night Amy dreamed that she was a small child about Jane’s age. She and her brother, Michael, were playing near an old house. The house, evidently once a mansion, was now in ruins and the neighborhood was no longer a good one. All around the mansion were squeezed in other similar houses, once the homes of rich people, but now cut up into cheap apartments. The one they were playing near was the largest and even in its ruined state there was a gloomy grandeur about it. “Look, it’s a castle! Just like I told you!” the boy, Michael, told her, taking her hand. His brown eyes danced with suppressed excitement. Impatiently he pushed a lock of black hair out of his eyes. “Mama said we weren’t to play near the old Reese house. She said it was condemned, that they were planning to tear it down, and that it was dangerous.” There was something forbidding about the old house that Amy didn’t like. Reluctantly, Amy let Michael lead her toward the house. The door wasn’t locked. “I’ll wait outside for you,” Amy said, losing her nerve at the last moment. “Chicken!” She watched as Michael disappeared into the hollow shell of the half wrecked house. Michael seemed to be gone for an awfully long time. Long shadows were gathering in menacing clusters around the old house. Perhaps she had better go in and look for him. He could be lying somewhere hurt. Her heart thumped harder at the thought of venturing alone into that shadowy ruin, but Michael was her brother and she loved him dearly. Her foot caught in a crack, causing her to lose her balance. Lying stunned on the sidewalk, and looking straight up, she saw the frieze of stone faces and gargoyles around the house. She had never seen anything so ugly. A feeling of such loneliness as she had never known seized her, loneliness that became sheer panic as her gaze caught and was held by the gaze of a demonically carved gargoyle with his stone tongue sticking out in a leering grin. Slow eternities went by as she watched the gargoyles go on laughing, cold, hard, silent, mirthless stone laughter. If only she knew why they laughed she would know everything there was to know. Understanding was slowly beginning to dawn on her. She had almost grasped the secret of the terrible stone laughter when she felt Michael’s hand on her shoulder. Amy awoke then in a cold sweat. It was an hour before she dared turn out the light and go back to sleep. 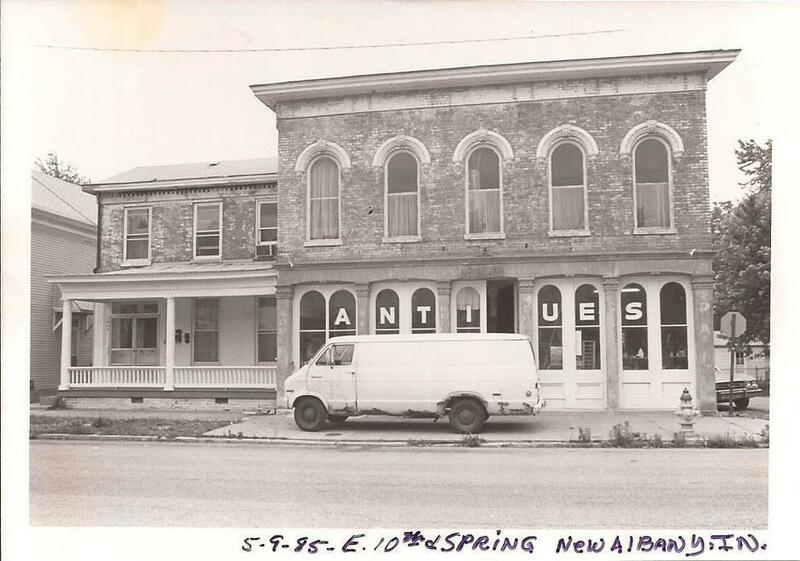 This is another one of the "old man face" photos from Mama's book of old buildings in New Albany. Until I got to searching through the various photos for possible illustrations for Amy's book, I assumed that the photos were all of the same building, but they aren't. New Albany is a very old city and so there are lots of old buildings with elaborate carvings on them. At the time Mama and Daddy took these photos there were more of those kind of buildings--they continue tearing more of them down every year. Even at that time, they were destroying many of the old buildings. Mama told me that whenever she and Daddy heard of one of the buildings slated for destruction, they tried to get photos of it before it was gone. This is the whole building that the old man face appears on in the previous photo. I doubt if the building is still in existence now. It appears to be still in business in this photo, but it looks very old even then. 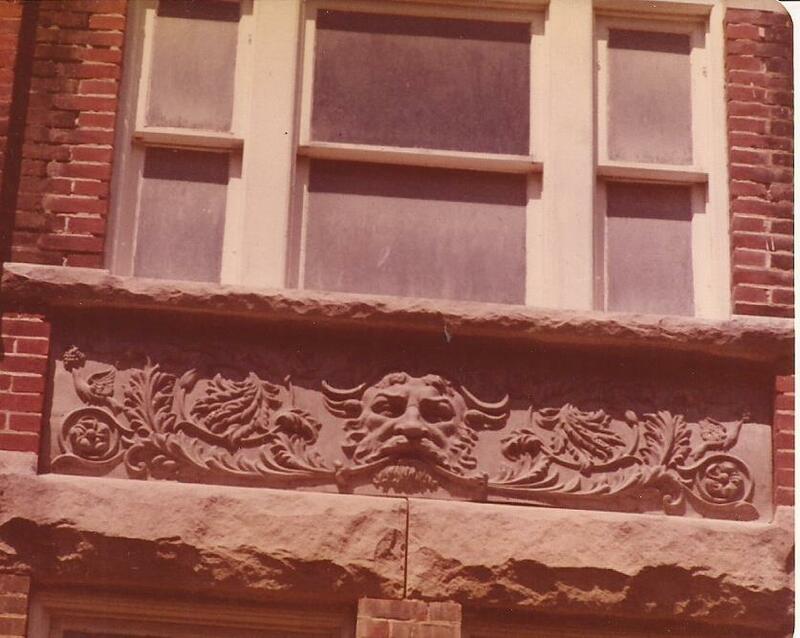 As you can see in this complete photo, there were a number of the carved faces on the building. The single old man face in the previous photo was a close up of one of them. Daddy had various special lens for his cameras to get close ups and other special effects. He only developed black and white film in his basement darkroom. He found out that the chemicals to develop the color photos were much more expensive and did not keep as long. Everything on this document also bookmarked. Research to be continued and used each month on blog along with chapter of Amy’s book to be published each month. Started publishing continuing gargoyle research in the January 2019 blog along with Amy’s book chapters. Am continuing with the search term of gargoyles but most of the information is not relevant, referring to books, fantasy stories, movies, etc. or places to buy gargoyle statues. Will continue checking this out a bit longer and then switch to another search. Did find this nice website several pages down in the search list. There is historical information and also many photos of gargoyles and grotesques. According to what I found out the gargoyles are working waterspouts, but the grotesques are just decorative, but both were used on the old buildings. The gargoyle article is from a website called Crystalinks by Ellie Crystal. I did not have time to read the entire website, as my purpose now is just to look for gargoyle information. Ellie describes her website, which appears to be a personal website, that she also uses to get customers for her “psychic readings”, as a “metaphysics and science” website. She has a lot on her website, and I bookmarked it to check out more later. Some of it looks very interesting. She also has a novel for sale on Amazon—the link is on her website. I looked at that briefly and requested a free sample from Amazon. I seldom buy a book from Amazon anymore without getting a free sample first, then, if I want to read more, if possible, reading it for free on Kindle Unlimited. Only then, if I want to keep a copy, do I actually buy the e-book. If I really like the book, I also buy a hard copy of the book too for my library. I just sent for the sample and haven’t had a chance to read it yet, so will not comment on the book here, but it looks interesting. That is, it for the gargoyle research for this month. I had planned to do a bit more, but already have a book chapter and a short story to post this month, as well as quite a bit of research on the barite roses. And I just searched for some flower photos and downloaded several that I want to use and will also need to look for a few photos of Mama, Daddy, Gain, and Hammerhead to post. So there probably won’t be enough room to post anymore gargoyle information this month. There is a bit more research on gargoyles on last month’s blog post if you want to check it out, and I will look for more to publish next month. This photo is from a book of just photos that Mama and Daddy took of the Odd Fellows Home in Greensburg, Indiana. There may be more books from that time. 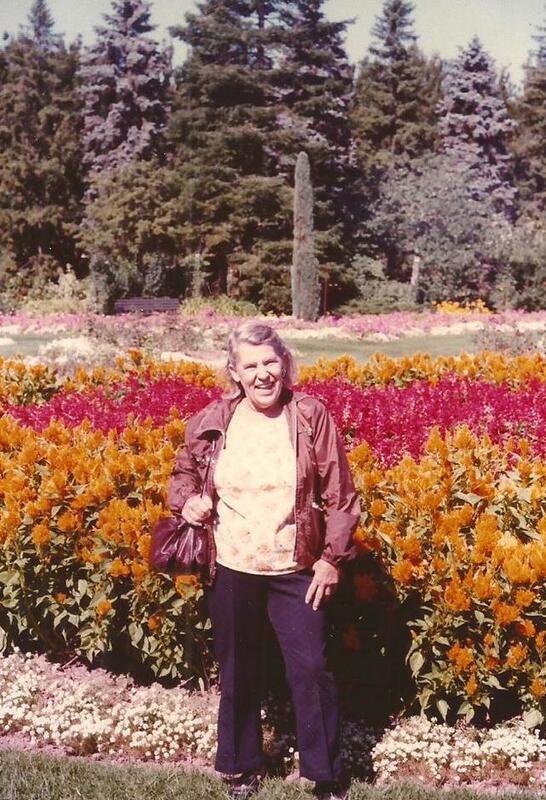 My grandmother, Bertha Henson, was a patient at the old Odd Fellows Home for several years before she died. It had been made into a nursing home, and Mama and Daddy got up to visit her at least every month. Daddy was still working then and it was a long drive. That beautiful old building was later also torn down. There are also photos of it being torn down in Mama's book and I have published some of them and will publish more later. I scanned and cropped this photo to use as the cover photo for Amy's book. When I found this photo I thought that the other photos I am publishing here were of the same old man face, but after I looked at them again, I could see that they are all different. After Daddy retired he and Mama had time to travel quite a bit and they took many photos of all the places they visited. This photo is from one of the books of just Canada photos that they took. Mama also has several books of photos she took when Gain and I visited her and Daddy. They always planned special things for us to do whenever we could get down to visit them. This photo was taken during a ride on the Belle Of Louisville, a restored steam boat that is now used for tourists. We had fun that day. 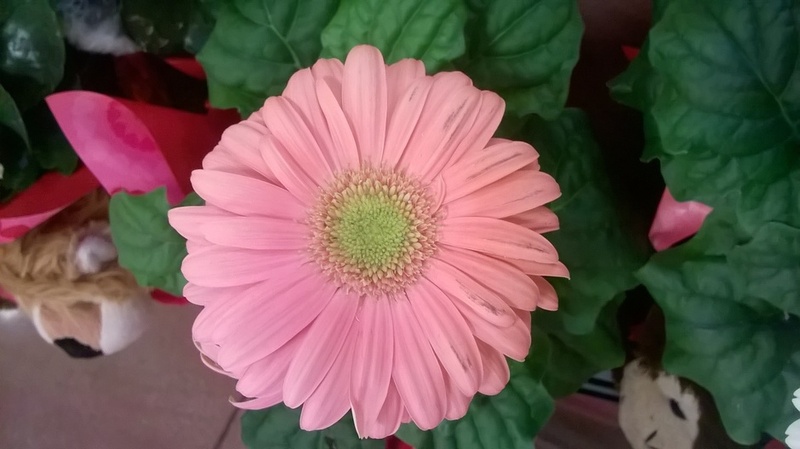 This is another one of the flowers I photographed in the Kroger flower shop, then managed by Cherie. I used to plan something special for Hammerhead each day after I started driving. 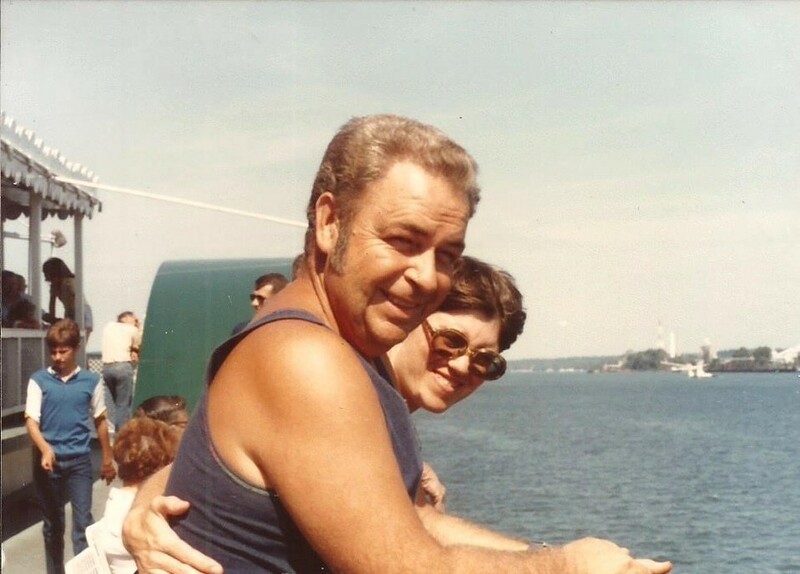 When he was still driving, he would say that we would go various places "if it came handy", but years would pass and he would never get over to Wal-Mart or other places he might want to go. After I started driving him, I made sure he got wherever he might want to go and planned special places to take him each day. Usually Tuesdays were "Wilderness Day" when I would try to find a little bit of what wild areas were still left in the city for him to enjoy. Bell Avenue, which was close to my house and on the way back home from his house was one of our favorite places to stop for a few minutes after our breakfast at Wendy's and any shopping he wanted to do that day. The old railroad tracks are gone, but the path is still there. In this photo Hammerhead is looking for wild plants. He knew all the wild herbs that were good for medicine and I knew all the wild flowers. I think he is looking at wild lettuce in the photo. 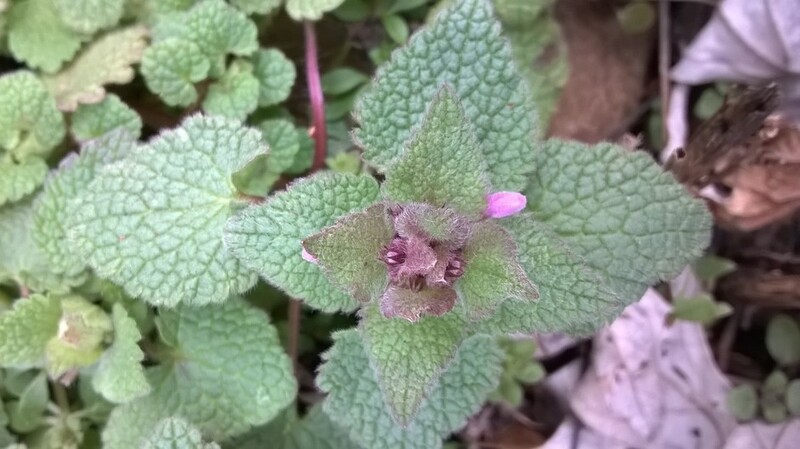 He taught me to recognize the wild herbs and what they are good for and I showed him which ones are wild flowers. The wild lettuce has small yellow flowers and is used for some kind of herbal remedy. I can't remember what he said it was good for, but it would be easy to look up on the Internet. I started looking up more about it at one time. I know it is used for medicine not salad, though. I have been working this evening for a couple hours to get the blog posted. I am not sure how much space I have left on it and I haven't proofed it yet. I am going to take a break now for supper--going on seven o'clock now, but am just going to make a sandwich. So I may be able to get at least the first proof done tonight. I have concentrated on mostly just posting, not correcting anything yet, so the work is going faster that way. When I get back I'll see how much is left for the diary entry. I hope there will be at least enough space left to write about what is to be published next month. If there isn't, I may have to take at least one of the flower photos out, but I really don't want to! As always, I will post in the diary when the blog is finished and proofed. I stopped work for a few minutes to get a quick, but pretty good supper of leftover barbecue chicken sandwich with mayonnaise on wheat bread, potato chips, and milk. Not sure how much proofreading I can get done tonight, as it is going on eight o'clock now. I will, before I quit, though, let you know what next month's blog post will be about and make sure there is going to be enough space left for that without taking out any of the flower photos. There will be another chapter of Amy's book, of course. Chapter Four will be published in March some time. In this chapter Amy talks to the grandmother, who Amy is sure knows the secret of the gargoyles' bitter laughter, to try to find out why they laugh silently and perpetually. Amy also learns a bit more of the history of Stone River Manor and sees more of the spooky old mansion. She also has her first date with Michael. They go to a fancy restaurant with an ice skating rink and potted trees outside. Their table has a view of the ice skating rink and Michael promises to take her again so they can skate. I may have pictures of this place, which is based on a real place in Louisville. We did not go to the restaurant or the ice skating rink, but we did walk around and look at the trees and the fountains and I seem to remember seeing a photo Mama took of Gain and me there. I will try to find it and publish that next month too. 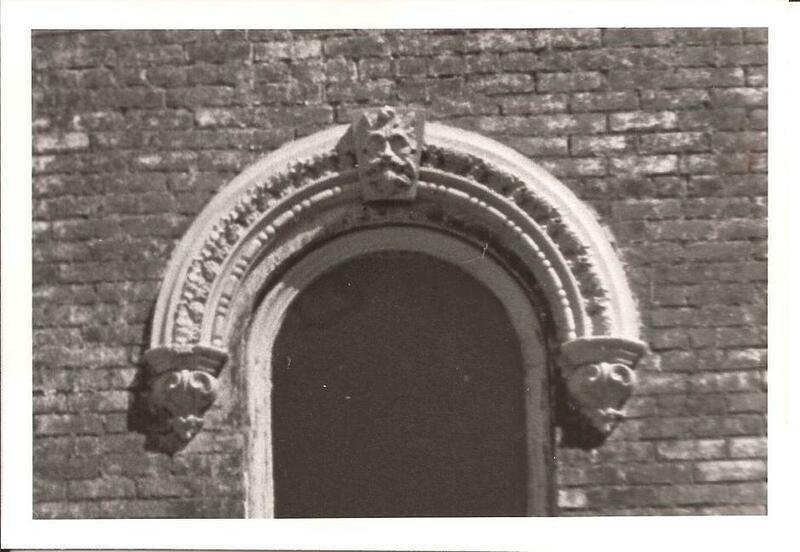 I will also try to find more photos in Mama's books that she took of the stone faces on old buildings to publish to illustrate this chapter. 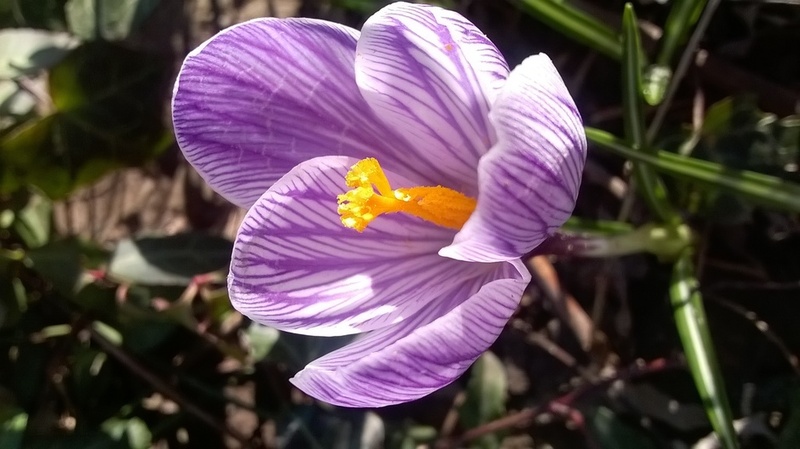 And more flower photos, of course! I will do a bit more research on the gargoyles and other things that may be of interest to publish next month also. Besides Chapter Four of The House Of The Laughing Gargoyles, I have also gotten Mama to agree to be guest blogger again in March. I will be publishing one of her letters to me written on March 19, 1992 describing some of the picnics and other trips that she and Daddy had recently taken together. I just finished the manuscript proof of the blog and it looks good! I haven't done the published proof or checked the links yet, but will get to that tomorrow. So if you find mistakes the blog isn't finished yet! I will publish when it is finished so you know. There was plenty of room for everything this month, and I didn't have to take out any of the photos. If you want any of them, download them, and share with anyone you want to or publish them as you like. I don't care. The March blog will be published sometime in March, whenever I can find all the photos and do the research I'll need. After that, I think I'll be able to start publishing at the first of the month, starting in April. I'm still working on getting material ahead for future posts so I have it ready. And as soon as I can get it written, I'll be publishing the next chapter of Mariette's book and also publishing a chapter of it each month for her along with Amy's book and whatever else I might find. I have a lot of written material and photos, just need to get time to get them ready to publish. I am about to get caught up on the housework, though, so soon I am hoping to have time to write everyday. Until next month. Thank you for reading my blog. Amy thanks you for reading her story too! 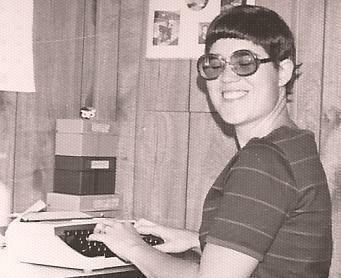 1:10 P.M. Just finished final proofreading of the February blog. Made minor corrections and the February blog is now complete. Will get the March blog published as soon as I can, hopefully later this month. Thanks for reading my blog! Amy thanks you for reading her story!